Pajama Party at the Carousel! 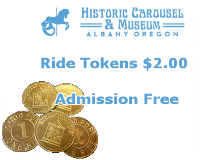 Kids will be out of school for MLK Day… bring them in their jammies to ride the carousel! This is a ticketed event and we expect tickets to sell fast! All tickets will be sold at the gift shop and are $5. Seating is limited to 80 participants – parents must have a ticket if they are sitting with their kids.